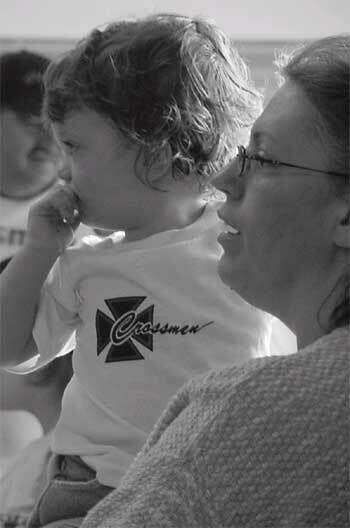 Carole Shearer, a Crossmen mom/volunteer, sent in this one. "Hi -- this photo was taken during ensemble time at the end of the Crossmen's April/May camp weekend, when parents and volunteers gathered to listen before the weekend officially ended. As the Crossmen ran through their show and other music, 13-month-old Andi Lennox, held here by Crossmen mom (and her grandmother) Juli-Anna Lennox, was their smallest/biggest fan. "Once Juli-Anna put her down, she literally danced through the entire run-through. She is also the grandaughter of Crossmen parent and volunteer Mike Lennox, daughter of Laura Lennox, and niece of Crossmen bass Chris Lennox." Thanks Carole!